Annapurna Circuit Trek is a classic trek and considered to be one of the most popular amongst the treks in the Annapurna region. It involves a 100-mile plus circumnavigation of the Annapurna Range offering the best natural scenery and indigenous cultures of Nepal. The trail starts in Beshisahar and follows along the river Marshyangdi through a variety of different landscapes from subtropical lowlands to the higher altitude going in a circuit. As you walk higher, the valley becomes more rugged until you reach the Manang basin. While trekking to Annapurna round, you will pass through many settlements, meeting the local people and enjoying the spectacular views of massive Himalayan Peaks that include Mt-Annapurna-I , Manaslu, Macchupucchre, Dhaulagiri, and Langtang Himal. Crossing over Thorong La (5416m) can be sometimes very difficult or perhaps dangerous due to bad weather and blockade of the pass during the unanticipated snowfall in between November and February.. 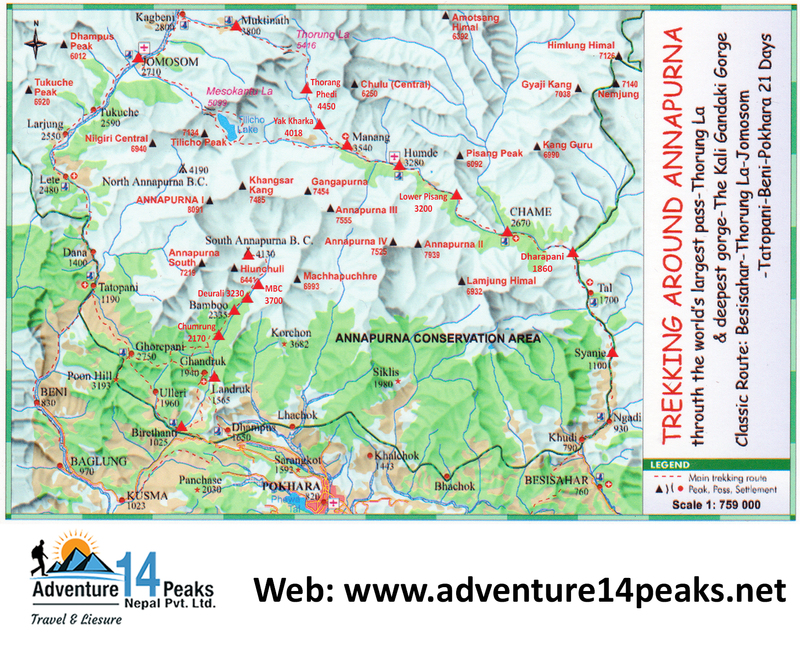 Therefore, we suggest whoever does Annapurna Circuit Trek must be well prepared and well equipped. After crossing the Thorong La Pass, the trail keeps going to Muktinath, a popular Hindu shrine. The best direction to trek the Annapurna Circuit trek is always counter-clockwise as we slowly acclimatize from lower to higher altitude. Due to accessibility of off- road up to Jagat, we can begin the trek normally from here to Dharapani in one day and from Dharapani to Manang in four days. We take one extra day on arrival in Manang (3420m) for side excursion and acclimatization before ascending to most popular Thorong La Pass. The major highlights of Annapurna Circuit Trek is to explore and experience the glimpse of mountain vistas from the lush green rice paddies of the low altitude to the arid higher region, and ecological and cultural diversity of each place. For the first time trekkers, Annapurna round Trek could be the best choice for those who want to observe lifestyle of different ethnic groups, their rich culture, traditional lifestyle from close range. Annapurna Circuit trekking to Annapurna region can be made shorter up to 14 days or longer up to 18days depending on the time and affordability of the trekkers. The best seasons for the Annapurna Circuit Trekking is Spring (March to May) and Autumn ( Sept to Dec) . Your guide will meet you at your hotel in the morning to begin your city tour of Kathmandu. You will visit the Boudhanath temple, the largest Buddhist stupa in Nepal, Pashupatinath, a Hindu pilgrimage site, and possibly view cremation ceremonies along the banks of the Bagmati River and continue drive to Patan Durbar Square to take in ancient Nepalese architecture and end your tour after a lunch. The trail makes a long climb with excellent views of the Manang valley and Tilicho peak (7134m), before reaching to the Manang airstrip at Humde (3280m). Crossing to the north bank of Marshyangdi on a bridge the trail reaches Mungji (3360m) and then climbs to Bryaga (3550m), a Tibetan-style village. Finally after leaving Bryaga, you will reach Manang. Overnight at Manang. From Manang, the trail crosses a stream, climbs to Tengi, and then continues to climb out of the Marshyangdi valley before reaching the small village of Gunsang (3930m). The trail passes through a sparse forest of juniper, rose, and barberry and crosses a large stream to reach Yak Kharka (4090m). Walking about an hour further you will reach Letdar. Overnight at Letdar. From Letdar the trail continues to climb along the east bank of the Jar sang Khola then descends and crosses the stream on a bridge. Then making a short descent you will reach to Thorung Phedi. Overnight at Throung Phedi. From Thorung Phedi, the trail becomes steep; following rocky ridges you will reach Thorung La (5416m), which is the highest point of this trek. From here the views are outstanding. The trail descends steeply and during the decent there you can see sights of Mt.Dhaulagiri. You will reach Chabarbu (4290m). The trail crosses a meadow and leads to Muktinath where you can see the impressive temple of Lord Shiva. Overnight at Muktinath. The trail follows through beautiful enchanting forests of rhododendrons, oaks and pines with constant views of the Annapurna & Dhaulagiri mountain range. From Tatopani you climb up to Ghorepani through wonderful misty forests. Literally, ‘ghora’ means horse and ‘pani’ means water, which translates to ‘a place where horses are stopped for rest’. You take an overnight stay at Ghorepani and enjoy the magnificent view of the mountains-Dhaulagiri, Annapurna, Nilgiri, Machhapurchhare and Tuckuche peak. The trail goes all the way downhill to Ghandruk village . This is the most pleasant day of your trek .There are so many flowers everywhere you go–on the trail, in the villages, in every tea house–flaming red poinsettias, colorful bougainvilleas, hedges of bright orange marigolds, huge roses, chrysanthemums and you can so easily take so many beautiful photos with the flowers, the mountains, the blue sky, the clouds and of course the local people, old and young. On trek, we see children running on their to school. They will greet us with their cheerful laughing voices: "Namaste!" and will very obligingly stop to pose for a photo. Personal expenses such as telephone calls, alcoholic beverages, cold drinks any bar bills.